Michigan Gov. Rick Snyder: Direct sales were already prohibited under state law. DETROIT -- Michigan Gov. 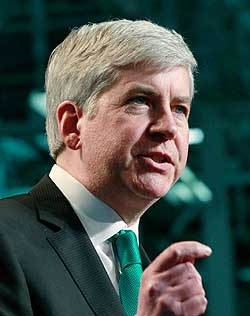 Rick Snyder signed a bill Tuesday that effectively bars Tesla Motors Inc.’s direct-sales model in the state. While Tesla’s model was already prohibited in Michigan, the wording of its franchise law left an opening that the automaker could potentially exploit as it has in Massachusetts, where dealers unsuccessfully tried to stop it from operating a store there. That potential loophole is now closed. Snyder said in a letter to lawmakers that an open discussion should be had on whether the current retail model should be changed. He urged the legislators to make this discussion a top priority in their next session. “We should always be willing to re-examine our business and regulatory practices with an eye toward improving the customer experience for our citizens and doing things in a more efficient and less costly fashion,” Snyder wrote in the letter. Diarmuid O'Connell, Tesla's vice president of business development, said the company will explore its legal options and is ready for the open debate that Snyder called for. To draw contrast, O’Connell said automakers in Europe and China have their own stores in addition to dealerships that freely compete in the market. “Which is it, Governor? Does the law change anything or not? If it doesn't, why did the car dealers want the changes? Why are you signing legislation that doesn't change anything? We've passed the silly hour -- now we're living in la-la land." In the days leading up to the decision on H.B. 5606, Tesla and CEO Elon Musk turned to social media to rally support. In addition, several Tesla suppliers in Michigan sent letters to Snyder urging him not to sign the bill. The electric-vehicle manufacturer contested a last-minute amendment to the bill that it said would cement the “broader retail monopoly” of dealerships. In a blog titled “A Raw Deal in Michigan” posted last week, Tesla says Republican state Sen. Joe Hune added new language to the bill using a method that stopped lawmakers and the public from knowing what was going on or allowing debate. On the flipside, the Michigan Automobile Dealers Association has maintained that Tesla is welcome to do business in the state. General Motors said Tuesday that it supports the legislation because it helps ensure that all auto manufacturers follow the same rules to operate in the state. The alteration to the Michigan law prevents what happened in Massachusetts. Dealers there sued Tesla for operating a store, but the lawsuit was thrown out by the Massachusetts Supreme Judicial Court on Sept. 15 after it was decided that dealers didn’t have the standing to block Tesla’s direct-sales method. The court denied the appeal by dealers, going along with a December 2012 lower court ruling. Massachusetts state law only allows dealers to sue a manufacturer they have a franchise relationship with, Crain’s Detroit Business reported. Tesla continues to operate a store and service center there. Tesla told Automotive News last month that the Massachusetts decision was the most powerful ruling it had received in its ongoing battle with dealers. Then on Sept. 18 in Michigan, the state’s House of Representatives passed the bill, which was originally drafted to keep automakers from forcing dealers to charge different documentation fees to different customers. But on Oct. 1 in the aftermath of the Massachusetts ruling, the word "its" was taken out on the Senate floor from a section declaring that a manufacturer shall not "sell any new motor vehicle directly to a retail customer other than through its franchised dealers." The amended bill passed the next day in the Senate 38-0 and was sent back to the House, where it was approved 106-1. The change was crucial because the word "its" in the existing law assumed the manufacturer has dealerships, Crain’s Detroit Business reported. In Massachusetts, the court ruled that the Massachusetts State Automobile Dealers Association didn’t have the grounds to bring a case against Tesla. Crain’s Detroit Business reported that only a Tesla dealer could sue to stop Tesla, and Tesla does not have any dealerships. By removing the "its," Crain’s Detroit Business explained that any automobile manufacturer is banned from selling new cars directly to customers, regardless of whether it has dealerships. "What we have tried to show to the governor and his staff is that the entire purpose of the Michigan statute was to regulate relationships between manufacturers and their franchisees," said Todd Maron, Tesla's general counsel, in an interview Wednesday. "We showed him that in great detail how every provision in the statute does that, and only that. The language that the dealers put in at the last minute was intended to change the statute from that singular purpose to something totally different." Chris Gautz of Crain's Detroit Business and Amy Wilson of Automotive News contributed to this report. Tesla courted suppliers in bid to stop bill banning direct sales in Mich.